One day after news broke that three police officers accused of beating a Homewood teen last year would return to duty, roughly 150 angry protesters -- some holding signs reading "F*ck the police" -- gathered outside the City-County Building today, demanding justice. "Police need to be held accountable for their actions," said Brandi Fisher, chair of the Alliance for Police Accountability. "Police will not beat our children at will and get away with it ... We will not stop until something is done." During a press conference yesterday, Police Chief Nate Harper announced that officers Michael Saldutte, Richard Ewing and David Sisak would not face any disciplinary action stemming from their controversial arrest of Jordan Miles, in Homewood, on Jan. 12, 2010, and that the officers would soon return to duty. The chief's announcement followed federal investigators' decision earlier this week not to pursue civil-rights charges. Miles had accused the officers of brutally attacking him in Homewood without identifying themselves as police. The officers, however, claimed Miles, then a CAPA senior, was sneaking around a Homewood residence with what they thought was a gun -- and that he ran away after they confronted him. Charges against Miles were later dropped by a district judge. Hoisting signs reading, "F*ck the police" and "Stop police brutality," protesters denounced Harper's decision to reinstate the officers without any disciplinary action. They also questioned the U.S. Department of Justice's claim that there was not enough evidence to prove beyond a reasonable doubt that the officers violated Miles' civil rights. "I was hoping that charges would be filed," South Hills resident Carol Lynn Vicini, 60, told City Paper in an interview before the protest began. "I was disgusted" by the news that the officers wouldn't be charged. "But am I surprised? No." After hearing that the officers would return to duty without being punished, "I was sad, frustrated and disappointed," added Sister I, 36, of Garfield, "but eager and determined" to fight for justice. Tim Stevens, chair of the Black Political Empowerment Project, implored District Attorney Stephen Zappala to press charges against the three officers, even despite the fact that the feds decided not to. After all, he said, federal investigators did "not say a crime was not committed." Stevens said the Department of Justice merely concluded that they lacked the evidence necessary to sustain a conviction. "[The officers] were not found not guilty," said Stevens, whose words prompted chants of "guilty" among protesters. "A crime was committed on Jan. 12, 2010." As the protest drew to a close, Fisher read a prepared statement from Miles' mother, Terez. "We are outraged by yesterday's decision," she wrote in her statement, "but this fight is not over." 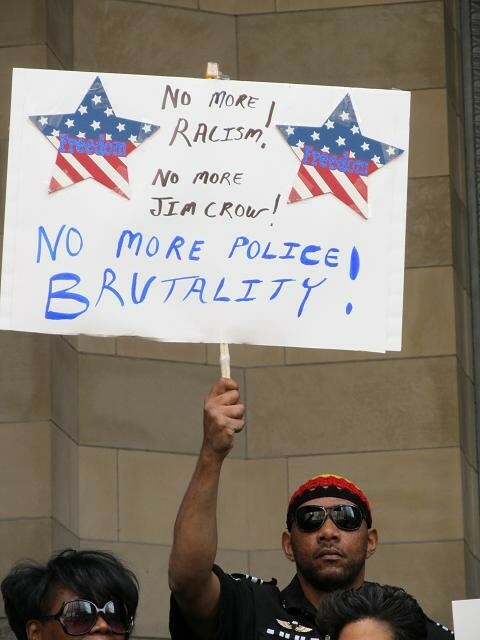 Indeed, the Alliance for Police Accountability is planning a protest at 1 p.m. next Sat., May 14, at the police department's North Side headquarters. The following week, another demonstration is planned to take place at the Office of Municipal Investigations, in the Strip District. A civil lawsuit brought by Miles against the city is also pending.